Enjoy drinks with a friend outdoors and in style with this three-piece pub set from the Key Biscayne collection. 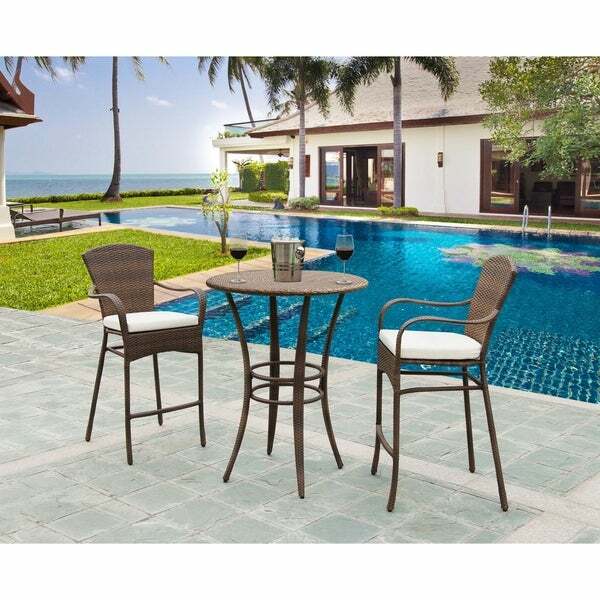 This set includes a table and two barstools with rust-free aluminum frames and comfortable outdoor cushions. "I am curious why this Panama Jack Key Biscayne 3 piece pub set is twice the cost of any similar or equivalent 3 piece pub set on ur site or other vendor sites? What makes it so expensive?" Hello James U., thank you for your inquiry. Unfortunately, the information you have requested is currently unavailable. You will receive an email notification once an answer is posted. Have a great day. "Are the arms of the chairs covered with the synthetic wicker or are they exposed metal?" Hello A_Shopper, the arms are covered in synthetic wicker. Thank you for shopping with us. "what is the seat height and can you buy 2 extra chairs "
Hello ccsabathia, the seat height is 29 1/2 inches without the cushions, with the cushions it is 31.5 inches. You are able to purchase additional chairs for this set, please follow the link; http://www.overstock.com/Home-Garden/Panama-Jack-Key-Biscayne-Stackable-Woven-Barstool-with-Cushion/9332460/product.html. Thanks for shopping with us!